Enotah CASA improves the lives of children in the dependency system by pairing them with trained volunteer advocates. Enotah CASA seeks to reduce and reverse the effects of child abuse and neglect. CASA alleviates the feelings of abandonment and alienation that scar these young lives by harnessing the compassion and gene rosity of caring adults who can and do have an enormous impact on the development of the child at all ages. The genius of the CASA model is that it effectively capitalizes on a huge reservoir of caring by mobilizing it in service to children. CASA makes the most immediate connection—one caring adult to one child in need—that can be the turning point in a life that has been interrupted and shaken. Our most significant accomplishments happen every day—when an overlooked opportunity is found, a service is secured or an adult connection is made that will help to keep a child safe and give him or her an opportunity to succeed in life. Many children remain in foster care for years, and are moved around to many different placements. Studies have demonstrated that children who are abused and neglected are at significantly higher risk for academic failure, chronic delinquency, homelessness, adult criminal behavior, antisocial personality, and addictions. Moreover, as a child’s length of time in out-of-home care increases, the probability of such negative outcome increases. CASA volunteers are instrumental in shortening the time that the child is in the dependency system (achieving either re-unification or adoption), while simultaneously assuring that the child’s needs are met. Enotah CASA is a member of the Georgia State CASA Association. 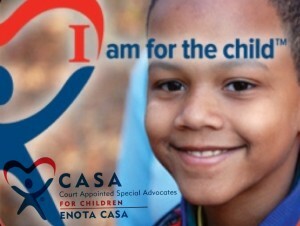 Enotah CASA’s mission is to mobilize community volunteers to advocate for abused and neglected children. Enotah CASA’s vision is a North Georgia community in which every foster child has an advocate and the opportunity to thrive.